Recently, a popular website boasted that Zion National Park is the most beautiful place on earth. Of course, how do you compare the white-sand beaches of Amanpulo with the mountainous regions of the Southwest? How do you compare a five-star Parisian meal with a banana? Saying anything “is the most…” is preposterous when comparing to something else. As you can see, I take exception to anyone claiming the best or the greatest in any degree, as life happens moment to moment; comparisons ultimately lose their integrity in context. However, the popularity of Zion National Park is not merely fabricated, concocted or fictitious in any sense of the words. We now have about 100 years of visitation data for the popular park. In the year 1919 total visitation was 1,818 people contrast that with 2017; total visitation was 4,504,812 people. Due to the popularity of the park a reservation system has been implemented to handle camping demands. There are three campgrounds in Zion National Park: Watchman, South and Lava Point. Lava Point is in the park however it is a 60 to 90-minute drive from Zion Canyon, making it the least popular of the three. With one huge exception; and if budget is a major concern, Lava Point is FREE of charge. That’s right, you do not have to pay any fees to camp at Lava Point, the downside its just over an hour drive to the main entrance, but to offset the drive, the universe has provided breathtaking scenery! The park is anticipating over 5 million visitors for the 2018 season, and by season we mean all 12 months. Reservations can be made by phone or online. With an expected gross visitation of five million and cumulative camping sites numbering a few hundred you should register as soon as possible, giving yourself a two-week to a six-month pre-planning window. If you cannot reserve a camping spot during the time you are planning to be at the park, there are other options just outside of the park with reasonable pricing and beautiful views. Typical pricing for tent camping is $20 per night. Potable water is provided. Typical RV camping is $30 per night, some of the campgrounds provide electricity some of them do not. Generators are allowed in the morning and evening at South Campground but are not allowed at Watchman. We hope this points you in the right direction for your upcoming adventure. Remember, everything is going to work out to make this a trip of a lifetime. 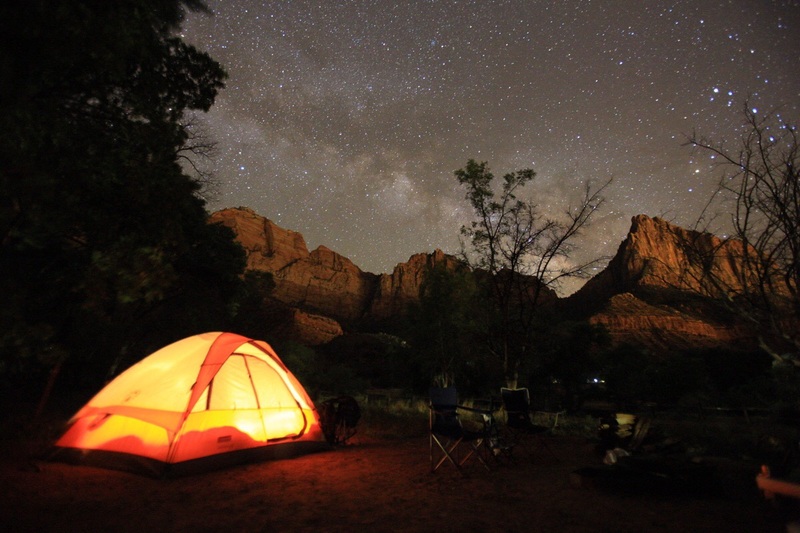 Camping in Zion is one of the best things that you can do to truly experience all that there is to offer in Zion. Looking up at the stars from your tent in Zion as you go to sleep is something that everyone must try at least once in their life. Special thanks to Instagram user: Mitch Anderson / Reddit User: Heroicarts for his photo.